I had half made up my mind to tweet about my impressions of Pakistan Tehrik-e-Insaf's (PTI's) Karachi rally today (yes, I did go despite the lack of Christmas pudding on hand) but seeing as how each tweet usually seems to end up needing two or three more to clarify and how, inevitably, someone's who's missed them asks you why you did not say anything about such and such, I decided it might be better just to do a brief post on the whole thing. 1. It was a big, big crowd: Exactly how big? Who really knows? Nobody we knew had done the only acceptable way of enumeration, by counting the legs and dividing by two. But the general consensus among media hacks was that it was above 100,000 people. Could easily have been 150,000 also. 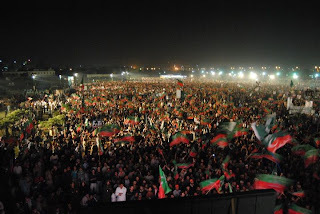 No, it was not 500,000 as the PTI spinners on stage were insisting by the end. No, there weren't a huge number of people outside the main ground or inside the grounds of the Quaid's Mazaar (which was set across the road from the venue). Let me do a bit of back of the envelope calculations to explain why these estimates are probably quite accurate. The front of the crowd was very packed and standing room only. But beyond about 50-60m from the stage there were chairs which obviously take up more room and the crowd also was less packed. In addition, the crowd was basically only directly in front of the stage in a rectangular space - some of the area to the right of the stage was sparsely populated since containers on which the media were cloistered blocked views of the stage behind them. Apparently the venue is a total of 58,000 sq. yards (this from a reporter who actually did the research). This includes about a quarter of the total area that was sparsely populated because of the reasons stated above. This means that roughly 75% of the total area or about 44,000 sq. yards was being utilized. Let us assume (generously) that half of this space was standing room only and that one person needs only about 2 sq ft to stand, while in the remaining half people had slightly more space or 4 sq. ft. These assumptions yield about 100,000 + 50,000 = 150,000 people. Give or take a couple of ten thousand. What everyone was agreed on, however, was that it was a very impressive show and that the rally was one of the largest Karachi has seen in recent times. 2. It was not a rent-a-crowd: I walked through the crowd from the back to the front and generally I came away with the impression that this was not a crowd that was bused in under any duress. I know that we had earlier tweeted claims from some sources that e.g. the lower staff of armed forces personnel had been ordered to attend or that the MQM was going to help out with crowds but nothing I saw today raised any proverbial eyebrows at least for me. There were a lot of single young men but there were also a substantial number of women and families. It was quite a heterogeneous crowd, all of which seemed to be really enthused to be there and to see Imran Khan. Will they actually all turn up to vote come election time, especially when the choice before them will likely be Ikhtiar Baig vs Khushbakht Shujaat vs Naeemul Haq rather than Imran Khan vs anybody else, well that's PTI's million dollar challenge. 3. A lot of money had been spent on this jalsa: A PTI source claimed 200,000 flags had been brought for the rally. Even if there were only half that amount, and even if each flag cost them only Rs. 20 (including the stick, the cloth and the printing), that's still Rs. 20 lakhs right there. 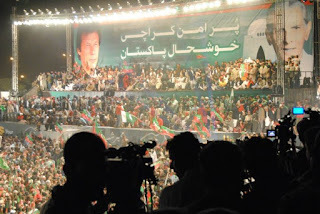 PTI had also contracted with an audiovisual company that was filming the jalsa (including on at least three cranes) and providing their visual feed to all the channels to supplement the channels' own coverage. Even the chairs were heavy metal ones, not the sort it would be easy for any lurking Kasurians to carry away. Add logistics, security, stage grids, furniture, generators, fuel, cables, lights, sound systems, construction costs, labour, food and refreshments for organizers and other payments and you can tell that the costs for this rally were easily above a crore at the minimum. Which fat cats pay for these expenses and why, is a question the media still needs to ask Imran Khan. 4. The music sucked: I think a lot of those attending were expecting more live music ala the Lahore jalsa. What they got instead were a lot more speeches, some sporadic pre-recorded music and Salman Ahmad (who, as @umairjav noted, strutted around the stage as if he was the shahbala and lip-synced to Ali Azmat's vocals). Come to think of it, at the time of the Lahore rally, PTI didn't have as many speakers to accommodate at the podium. With more 'heavyweights' joining, PTI youth may have to live with the fact that the music has died with the Lahore jalsa. Even Abrar-ul-Haq preferred giving a speech rather than singing. 5. The speeches were Meh at best: Nothing spectacular, nothing concrete, nothing specific about Karachi, just a lot of feel-good vagueness, including Chairman Imran Khan's. After spending 18 years in the wilderness you would expect PTI stalwarts to be able to present something a bit more substantial in terms of policy than 'we'll bring in clean people, provide justice and make a stronger Pakistan through better policies' but it seems that's all there is to it at the moment. Maybe Khan sahib et al felt this was just not the time to go into details. However, two speeches really tested my patience. One was by new entrant Javed Hashmi who just would not stop singing his own praises as a 'rebel' for a really, really long time. The other was Shah Mahmood Qureshi, who is just plain irritating. I don't think anybody there much understood what he was talking about either since he kept talking about "asymmetric power" and "credible minimal deterrence" in so many words. He also backtracked on his Ghotki speech and tried to spin his way out of embarrassment, by claiming that when he had raised alarm bells within the establishment by calling Pakistan's nuclear weapons as unsafe, he actually did not mean it physically but only in terms of policy. 6. 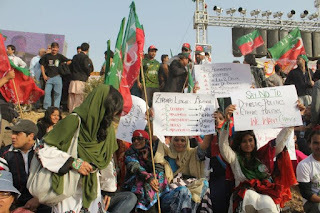 There were a lot of Aafia Siddiqui placards in the crowd: Javed Hashmi was the only speaker to refer to Aafia Siddiqui from the stage and nobody even paid lip service to the placard of another young man which called for setting fire to America ("Amreeka ke aiwaanon ko aag laga do!"). But you know that, eventually, PTI will need to resolve the contradictions among its youthful idealistic supporters and the ideologically motivated ones. 7. Other thoughts I had: a) Shah Mahmood was the only speaker who, I think, did not mention Imran Khan even once in his speech, while other speakers fell over themselves to pay him tribute. Whether that's a good thing or ominous, I leave for you to judge. b) I wasn't the only one who thought that everytime the crowd chanted a response to 'Dalaer Aadmi' [Brave Man] it sounded like they were chanting 'Nawaz Sharif, Nawaz Sharif' when they were actually chanting 'Hashmi, Hashmi.' It was just very funny. c) PTI really needs some more prominent women in its ranks. The stage sagged with male posteriors. And where was Dr Shireen Mazari? d) Listening to the slogans where Imran Khan was rhymed with everything from Pakistan, jaan [beloved] and insaan [human], I couldn't help feel sorry for Nawaz Sharif. I mean, the lack of possibility of rhyming anything with the PMLN leader's name must be a serious impediment to sloganeering. e) This 'revolution' will obviously be televised. And facebooked. And tweeted. Imran Khan ka hareef: Nawaz Shareef. Good unbiased information feed, answered all the questions I had. Felt like I was there! I was also thinking about the costs such a show entailed... whose money funded this...where did it come from?The stage had sooooo many people on it. Who were they? 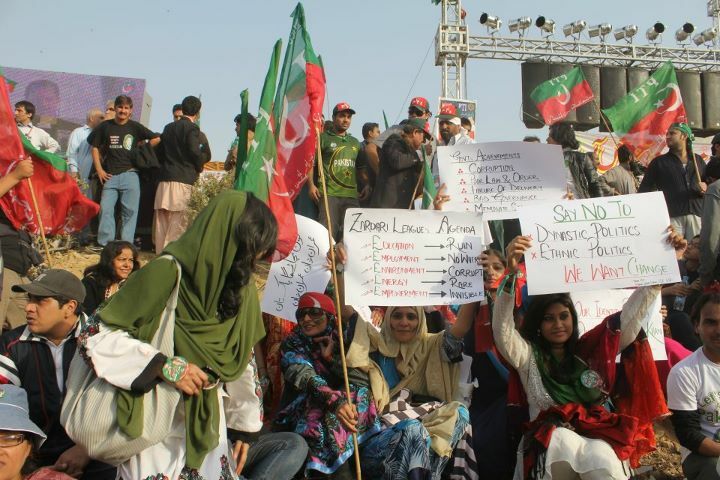 none of the recently joined supporters were visible...shafqat mehmood, shirin mazari, masood sharif khattak etc. A good writeup....has raised some of the questions in every sane persons mind. And, oh yes, who was the DJ? Lock him up and throw away the key!!! The crowd and cost estimation points were really thought provoking, though i don't know about Imran Khan's speech not being specific enough. Yes it's still based on broad terminologies, but still, how much specific can you get in a jalsa. Has any other party/politician done a better job of it? I think i'm going to research this for other countries. This cycle (the then united League's symbol) doesn't have a chain. There is no bigger swine than Nawaz Sharif. Translation doesn't rhyme and it isn't high literature in the original Pashto either but God it felt good chanting it when you had 20,000 others screaming it with you. Interesting to get a first-hand account and even more interesting to ask the question of who funded this. Following the money usually leads to even better questions. All you say is that there were ~150k people, who came of their own will, it was expensive and you didn't like the music or speeches. I just think a tweet would've sufficed. 1)I heard a PTI Official say something like this "we have a lot of foreign Pakistani's who donate to PTI" last night after the Jalsa.I dont know if its allowed. 2)I would like to know if any of our liberal bloggers would dare give us an alternative to Imran Khan ,or what would they do come election day or have they ever voted? @Umair J: Apologies. That was an input from a fellow Pyala who, upon checking, admits read it first on Twitter, which of course I had not checked before posting. You have been duly acknowledged. I live in Denmark and contribute Rs 10,000 monthly to PTI since i cant be part of this movement physically. And there was a major international PTI fund raising campaign before the jalsa. And i find it strange when people want a detailed plan for a jalsa. he laid out the salient features-framework. a direction. now there will be a team who would work on the micro details. when Martin Luther had "a dream" he didnt layout details. No one raises their voice against the current bad practices we have to endure. Now PTI is doing this in a big way - who is going to complain? . . . those who have something to lose from the status quo. Wake up guys . . don't be more loyal to your party than you are to your country. well most of money will be from international members of PTI like me who are giving monthly dollars for PTI even if they are not very active members but just want to do something good for this country. never heaard anyone asking about the funding of a jalsa before? where do u think the money for Altaf hussain's jalsa's come from?? Your Looted BHATTA money. that's right & PML(N)... well everyone knows the level of corruption of PML(N) & PPP. 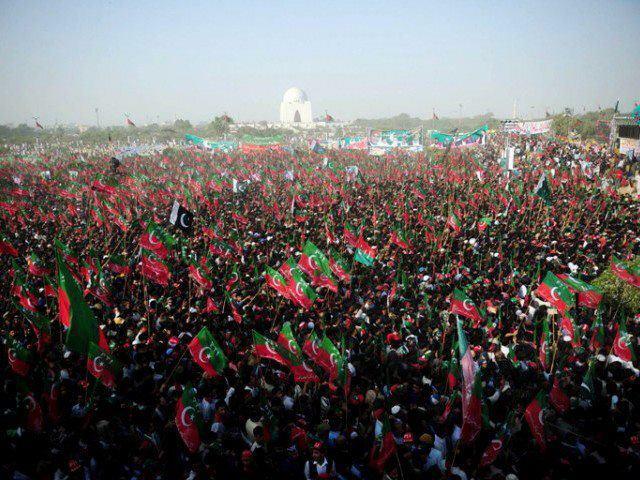 Imran's Karachi meeting was a success. Big Crowd. This raises one pertinent question which must be asked from the relevant quarters. Only a couple months ago Imran couldn't enter Karachi without tacit or explicit comsent of MQM let alone hold a meeting. What caused the change of heart or rather total metamorphosis. This is a very important question. If it was such an easy matter that just lifting of a finger or wave of a baton could pacify MQM then was Karachi subjected to violence that cause thosands of deaths? The powers that made this meeting possible is reponsible for deaths of innocent people over the past few years. Sheer logic? I appreciate the effort put into writing this blog post but I couldnt help realizing that no matter how hard one tries, no matter how sincere one becomes there are always going to be those who will find a way to belittle your efforts and doubt your sincerity. Problem with Imran Khan and his PTI is that people want to focus more on his and his party's shortcomings than whatever good he has to offer. I find it ironic that honesty, as precious as it is in Pakistan, is being taken for granted. adding to FA Bhatti, we as a country are so depressed, that it is niave to hope, it is a crime to dream, and it is a sin to believe in change. It is good to see you have stopped being a revolting snob when it comes to commenting on Imran and Tereek-e-Insaaf. What is one Rs crore? A mere pittance if you consider Imran's own earnings and the contributions that his Pakistani supporters - home and abroad - make. As for your obsession with "policies", you might like to tell us if the current government's "policies" promoting corruption, acts of lawlessness by dishonest elected legislators, politicisation of national institutions and deliberate looting of publicly owned enterprises are preferable to a group of honest people doing their best to reverse the injustices of the past? 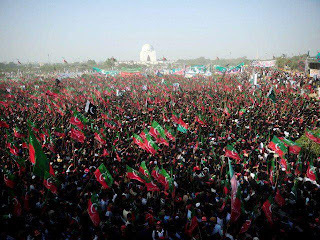 The broad outlines of the policies that Imran intends to follow have been given in his speech at Karachi's jalsa. Your pathetic demands to him to provide detailed plans at this stage sound childish. You seem sadly out of touch with the spirit of the time. Carry on with your clever-clever headlines - "Notes from the Revolution" - and self-satisfied reporting. Soon you will find egg being splattered all over your face with increasing frequency. 1.5 lac is pretty conservative estimate. I think it was more. But I agree with the funding question...pti should be clear. If its foreign pakistanis theres no shame in acknowledging them. Also while I agree about pti talking policy more, its not possible to do that in 15-20 minutes in front of such a crowd. 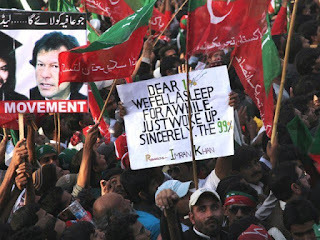 they should put out white papers and khan said they would so lets wait and see. Good and unbiased write-up. Appreciated all the positives and pointed out the flaws. Ofcourse there are limitations involved when you are setting up a political party. I personally know Azam Swati to be a cheat. His brother, a member of national assembly is a local goon. Azam Swati has covered his tracks well, so it is not possible to prove his corruption. But if you ask around in his locality everybody knows his history. I would not go into details here but he is certainly not a saint as he proclaims to be. Ibrar-ul-haq has a lot of question marks over his charity work and how he has used it to favor his kin. And the list goes on. But it is irrelevant at this point of time. Whether or not Imran is able to set up political party which works like an institute is a question that need to be focused and we will see the evolution over the next six months. As far as the funding for jalsas is concerned, those supporters of PTI who think it is only coming from their contributions are mistaken. There contribution is used in other party functioning but source of funding for jalsas is entirely different. A lot of rich and influential are funding Imran khan but they don't want their names to be revealed owing to political victimization. Though it is not for some personal favors rather it is the belief that Imran can provide them an environment which will allow them to invest in Pakistan. A level-playing field that is .. Otherwise they can very well multiply there income by playing within the rules. I agree with a few observations in this article and disagree with others. 1)The crowd was big, multi-ethnic and heterogeneous. Numbers are irrelevant. Although I agree that gross miscalculations should be pointed out. 2)On the vote conversion, if the elections are free and fair the general populous will look less at nominees and more at the party names, which in my opinion will give PTI the edge. 3)On funding, questions should be asked for clarification purposes, but lets not let those concerns overshadow the purpose and spirit of the event. If PTI is getting funding, its a good thing and demonstrates their support and strength. 4)Music sucked, agreed. Needless to say though, this was not meant to be a concert, rather a novel approach to a Jalsa that provides entertainment through music. Bottom line: The consensus seems to be that the crowd enjoyed. 5)Couldn't agree more on the speeches, especially those of JH and SMQ. Personal agendas overshadowed their support for PTI. Imran's speech was a summary of all that he has been saying in the past. Blanket policies, no concrete layout. While it is true that other parties aren't any better, the criticism still stands. Policy papers are welcomed. 6)As far as thoughts on chants and slogans, I fail to see the relevance of what the article says about them in the grand context. Final Word: Party selection, including minority, women and youth representation is key and will eventually shape the effective implementation or lack thereof of the policies that Imran talked about. I hope that the change that is promised is delivered. For now though, lets embrace the positivism and wait and see. I wonder why you people are so curious about IK when you fully trust Zardari who came from nowhere to become the president. I am 100% sure if you ask the business community of every province in Pakistan example (Lahore Chamber of commerce , Karachi Chamber of commerce etc) all of them would endorse Imran Khan . We the people of Pakistan are soo fed up with our corrupt leaders that , we would vote Imran Khan's Party only because his only qualification is that he is not corrupt.I would also like to ask XYZ ,have you ever Voted or will you vote this time around. I wonder why Shah Mehmood Qureshi referred his conversation with an ex-foreign secretary when the Foreign Minister of the same Govt. (Khurshid Kasuri) was sitting next to him, while he was talking about nukes! Doesn't this warm your heart? It's not easy job to generate this trust, and I'm sure IK won't abuse it (as suggested by most liberals). One or two meetings and the whole media treats it as though it was already a general election victory. Last weeks meeting of religious parties was no less in numbers than the PTI Lahore meeting was not even commented upon. Religious parties are known to manage huge crowds which don't convert into votes in the elections. There is a big possibility that PTIs campaign may end without success. There is a big question: Elections are scheduled after one year. Can PTI keep up the momentum that long. I doubt.